LOS BANOS, Calif. — A drone whirred to life in a cloud of dust, then shot hundreds of feet skyward for a bird's-eye view of a vast tomato field in California's Central Valley, the nation's most productive farming region. Equipped with a state-of-the-art thermal camera, the drone crisscrossed the field, scanning it for cool, soggy patches where a gopher may have chewed through the buried drip irrigation line and caused a leak. In the drought-prone West, where every drop of water counts, California farmers are in a constant search for ways to efficiently use the increasingly scarce resource. 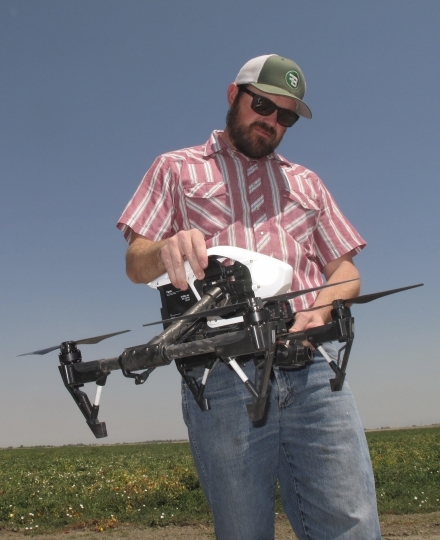 Cannon Michael is putting drone technology to work on his fields at Bowles Farming Co. near Los Banos, 120 miles southeast of San Francisco. About 2,100 companies and individuals have federal permission to fly drones for farming, according to the drone industry's Association for Unmanned Vehicle Systems International. Federal regulators Monday relaxed the rules on small, commercial drones, a move that could spur even greater use of such aircraft on farms. 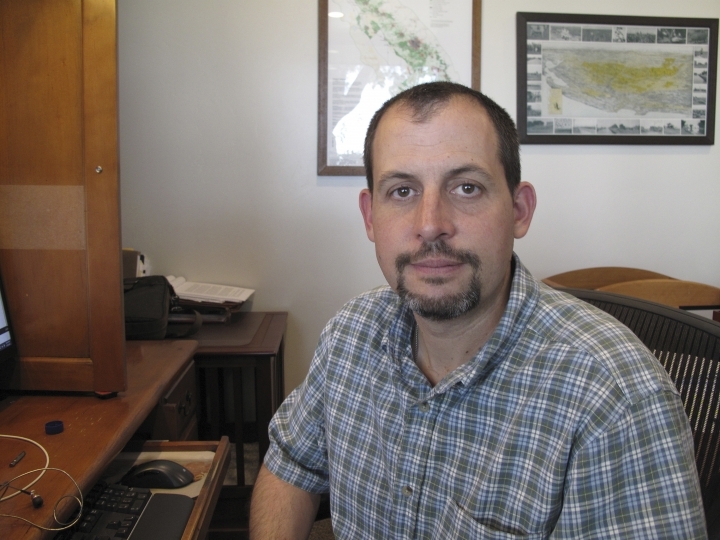 Michael is descended from Henry Miller, a renowned cattle rancher, farmer and Western landowner who helped transform semi-arid central California into fertile farmland 150 years ago by building irrigation canals, some still flowing today. Six generations later, Michael farms a 17-square-mile portion of that same land, growing melons, carrots, onions, cotton and almonds, while carrying on in the same pioneering spirit as Miller. "I've always been a big fan of technology," said Michael, 44, mindful of how climate change is making water more precious. "I think it's really the only way we're going to stay in business." 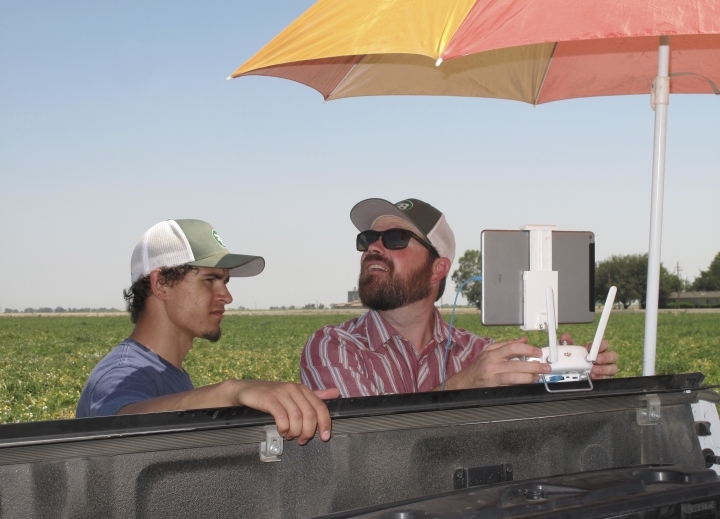 On his 2,400-acre tomato crop alone, Michael estimates that this year his leak-detecting drones could save enough water to sustain more than 550 families of four for a year. California endured the driest four-year period on record before a relatively wet and snowy winter this year overflowed some reservoirs in the northern part of the state. Southern California, however, remains dry, and the statewide drought has not ended. Beyond California, drones are becoming fixtures on farms in places such as Canada, Australia, South Africa and Latin America as they become more affordable and easier to use, said Ian Smith of DroneDeploy, a San Francisco-based industry leader in drone software development. A farmer can order a commercial-grade drone online for $2,000 and receive it in the mail days later, he said. 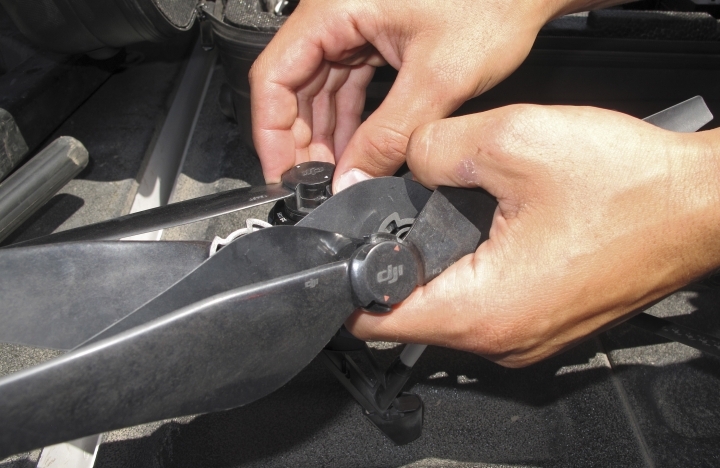 Its video camera is then paired up with a smartphone or computer tablet that is used to control the drone. "Hook it up to a smartphone. Boom. Take off and you're in business," Smith said. Many farmers, however, have yet to grasp the full potential beyond capturing video images of crops or using infrared cameras to spot color variations in the plants that can signal a problem. Few have used technology and invested in it to the degree Michael has. This year he began using the thermal camera, which can cost up to $10,000 and can show moisture variations in soil. He also created a new management position at his company dedicated to overseeing drones. Recently, Danny Royer, the new vice president of technology at Bowles, stood at the tailgate of his pickup studying live images transmitted to the screen of his tablet as a drone buzzed 300 feet overhead. Rows of mature tomato plants appeared on the screen in glowing burnt orange, indicating warmer, drier areas, while dark patches of purple showed the cool moist soil hidden below the plants. After taking the images back to his office to analyze them, he decided there were no leaks to repair, but the soil needed to be enriched in places to help the field grow evenly. On Monday, the Federal Aviation Administration eased the rules so that operators of commercial drones that weigh less than 55 pounds will no longer need to go through the long, expensive process of earning an airplane pilot's license. Instead, they will have to take a written test — but not an actual flying test at the controls of a plane — and will be issued a drone license for $150. 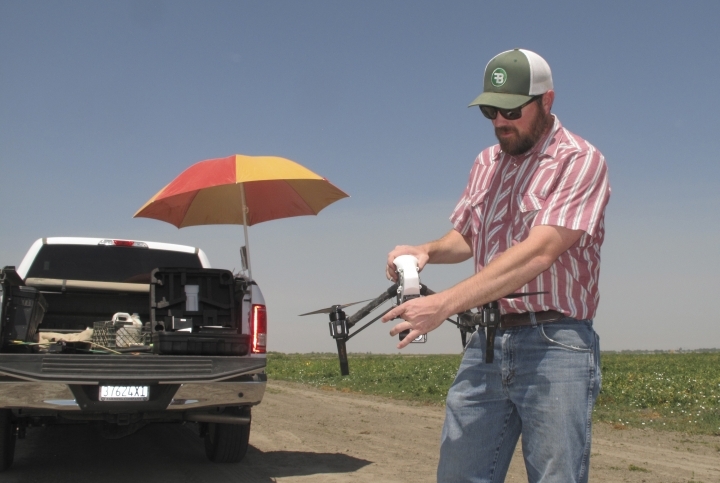 The rule change and emerging technology could make drones more attractive tools for farmers, said Brandon Stark, director of the University of California's Center of Excellence for Unmanned Aircraft Systems Safety, based at the Merced campus. However, he said that until federal regulators clarify parts of the new rules, commercial drones must continue to fly below 400 feet, limiting their use on very large fields. Stark is seeking what he calls the Holy Grail of drone use in agriculture — enabling them to directly diagnose what ails a tree, whether it's deficiencies in water or nutrients, or a pest — without having to send a person into the field. "We're just getting started," Stark said. "The research is really still in its infancy."